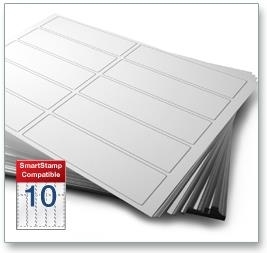 SmartStamp Direct Printer Printer Labels SSL10 are planned up with ten labels on each A4 sheet. The labels are die-cut into rectangles with enough space to print a post mark using the Royal Mail SmartStamp system. They are ideal for SmartStamp Bulk Labels and a cost effective alternative to Avery J5103 and L5103 labels. This product is popular with e-tailers using SmartStamp to speed up despatch by creating bespoke postage barcode labels on a pay as you print basis. Each label measures 135mm x 38mm and is made in high quality 70gsm white paper. Use them in all standard office printers using templates to space postal information accurately.